Contact this West Palm Beach Surgery Mistake/Error Lawyer if you’ve been injured during a procedure. Surgery errors/mistakes occur for all sorts of reasons. They also occur during all stages of the surgical process. For example, a surgical mistake/error may occur even before the procedure begins. You doctor may choose to do an unnecessary surgery. Your doctor may also decide to perform the incorrect type of procedure. Unfortunately, oftentimes doctors will decide to do surgeries, or to do the wrong types of surgeries, due to financial incentives. That is, surgeons may make more money based on the numbers of surgeries they perform, or the types of surgeries they perform. Mr. Quackenbush will work hard to determine if this was the case in your situation. If it turns out that it was, Mr. Quackenbush will use this fact in your case to show the motive of the doctor. Your surgeon may also decide to do surgery based on a mistaken diagnosis. If this occurs, then the doctor that gave the mistaken diagnosis (oftentimes a radiologist) will be responsible for the consequences. An unnecessary surgery can oftentimes cause dire consequences. Your doctor may also decide to perform surgery even though you had other “co-morbidities.” You are said to have co-morbidities if you had other medical problems other than the condition for which the surgery is required. For example, if you are stroke survivor who requires a knee surgery, your doctor might not want to perform the knee surgery due to the heightened risk of stroke. If the doctor does the surgery anyway and you have a stroke as a result, then the doctor will be liable. Before going through a surgical procedure, typically patients are mandated to undergo a series of tests to make sure they are fit for the surgery. This is particularly true for patients with co-morbidities. If your doctor doesn’t obtain clearance for surgery when he or she should do so, the doctor will be responsible if he or she performs surgery without it and catastrophic results ensue. Call Mr. Quackenbush at 954-448-7288 if you’ve been hurt due to a surgery anyplace in Florida (this includes Broward County, Fort Lauderdale, Miami and Miami-Dade County). Clients obtain compensation with the help of this West Palm Beach Surgery Error, Mistake Law Firm. Mr. Quackenbush will talk to you about your case for free. Surgical mistakes/errors also include anesthesia mistakes/errors. Anesthesia is a type of drug used to minimize the pain of a patient during surgery. “Local anesthesia” is typically administered by an injection. It is designed to control pain at one specific area of the body (for example, your teeth – in a dental procedure). “General anesthesia,” on the other hand, is designed to actually make the patient unconscious during the procedure. One danger of anesthesia results when too much of the drug, or the wrong type of drug (if the patient is allergic) is used. If this occurs, then the patient may not regain consciousness. This can result in a coma or persistent vegetative state. If the patient does regain compensation, then he or she may have severe memory or cognitive problems. If enough anesthesia is used, the patient may even pass away. If this occurred to your loved one, then an Estate will be created, a loved one or relative will be picked to be the “personal representative of the estate” (“PR”), and compensation will go to your loved one’s survivors (the “beneficiaries of the Estate”). However, there are certain restrictions/limitations on who exactly can be beneficiaries of the estate, so it is best to contact Mr. Quackenbush to let him figure this out. Occasionally, a surgery will be performed on the incorrect body part of a patient. For example, a doctor may accidentally amputate a patient’s left arm or leg instead of the right. Your surgeon will clearly be liable if this happened to you. Surgeons may also negligently leave objects in their patients’ bodies. For instance, surgical instruments and tools, needles, and sponges have been known to be left in patients’ bodies after surgeries. If this occurred to you and affected your health in any way, you may be able to pursue a medical malpractice case against the doctor who left the object in your body. Infections also frequently happen after a surgery. This can happen naturally (i.e., without surgeon/doctor negligence) or because of medical malpractice. If it happened without medical negligence, then it is still the doctor’s responsibility to follow up with the patient after the surgery and treat infection if it occurs. After all, it is commonly known that infections can follow surgery. If your doctor didn’t set follow-up appointments with you after your procedure and you developed an infection as a result, then you may be able to pursue a medical malpractice case against your doctor. Additionally, sometimes infections are caused by medical negligence. For example, surgeons, nurses and other medical staff may treat patients with dirty hands. As gross as it sounds, medical providers may fail to wash their hands after going to the bathroom and treat patients. If this occurs, infections can develop. Moreover, unclean surgical tools and instruments may cause infections in patients. Finally, surgeries which take place in unsanitary “OR’s” (“operating rooms) may lead to infection. For example, OR’s are supposed to have properly ventilated air and be proper temperatures. If they do not, then dangerous bacteria can develop and can infect patients through the open wounds required for open procedures. Doctors may also injure neighboring body organs or tissues when operating on body parts. For example, a surgeon may negligently cause lacerations to neighboring body parts. If this occurs, then internal bleeding/hemorrhaging may occur, and infections may develop. 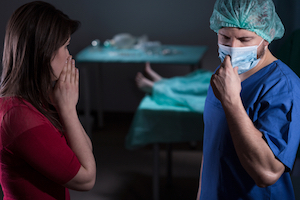 If you’ve been injured during a surgery, the defense attorneys in your case may argue that your injury was a “known complication” of the surgery. That is, certain surgeries can carry certain risks. Those risks can occur even if the surgeon did nothing wrong. If you develop one of these conditions, then the surgeon will not necessarily be responsible. However, before your procedure takes place, your doctor is obligated to tell you of those known-risks. That is, your surgeon is supposed to obtain “informed consent” before performing surgery on you. The consent to perform surgery must be informed in the sense that the surgeon has explained to you all of the known-risks. If your surgeon didn’t do this, then you may be able to pursue a lack of “informed consent”-case against the surgeon who failed to explain to you the known-risks of the procedure. Moreover, you will also be able to argue that the condition you developed after the procedure wasn’t a known-risk at all. That is, you will be able to argue that the surgeon didn’t live up to the “standard of care” of a reasonable physician, and this (and not the procedure itself) was the cause of your condition. If you are injured by a surgery mistake/error anywhere in Palm Beach County (including Belle Glade, Boca Raton, Boynton Beach, Delray Beach, Greenacres, Jupiter, Lake Worth, Lantana, North Palm Beach, Palm Beach Gardens, Palm Springs, Riviera Beach, Royal Palm Beach and Wellington), contact Mr. Quackenbush 954-448-7288. He will discuss your case free of charge to you.